Water exercise (also called aquatic exercise, pool therapy, or hydrotherapy) can include aerobic or endurance activities, stretching and strengthening exercises, and range-of-motion exercises performed in warm water. According to Johns Hopkins University, a good temperature range for most pool exercise is 82 F to 86 F. Therapeutic pools, usually heated from 92 F to 98 F, are appropriate for gentle range-of-motion exercise. Why Is Water Exercise Better Than Land Exercise? The buoyancy of water supports the body's weight. In waist-deep water, you bear about 50% of your weight. In chest-deep water, you subtract another 25% of your body weight. For osteoarthritis patients who struggle to stand and walk on weight-bearing joints, like the hip and knee, there is less stress on the joints in water. An exercise program performed in water is still an effective workout -- water provides 12 times the resistance of air. Walking in water allows the arthritis patient to build and strengthen muscle. Exercises that are painful on land are much less painful in water for people with arthritis. 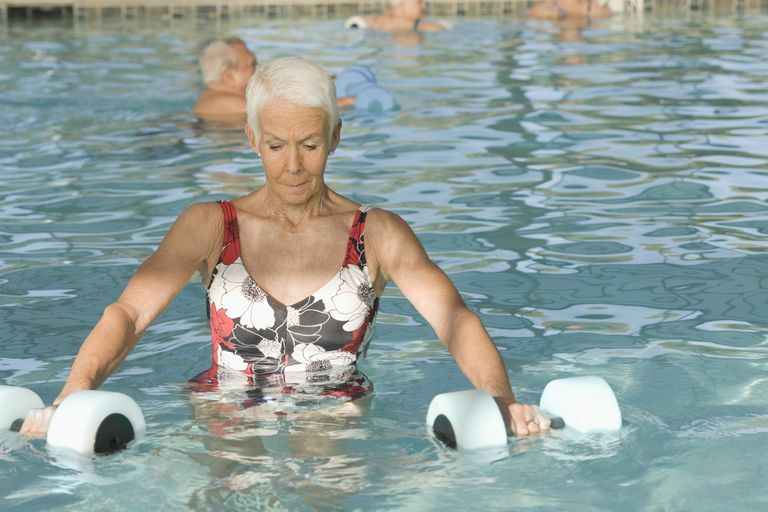 Does Water Exercise Help Osteoarthritis Patients? People with knee osteoarthritis and hip osteoarthritis who perform exercises in warm water get some benefit. According to a Cochrane Review published on October 17, 2007, researchers assessed 6 trials that included 800 osteoarthritis patients. Four of the 6 studies included patients with osteoarthritis of either the knee or hip. One study had patients with only hip osteoarthritis and the other had only knee osteoarthritis patients. In the studies, patients did water exercise for various lengths of time and various sessions. Other patients exercised on land or not at all. Most patients were assessed after 3 months. Researchers concluded that in people with osteoarthritis of the hip or knee, pain may decrease by one more point on a scale ranging from 0 to 20 with water exercise, and function may improve by 3 points on a 0 to 68 scale. Small to moderate improvement was observed for function and quality of life, with a minor effect on pain level. No effect was observed on walking ability or stiffness immediately after water exercise. Researchers believe water exercise has beneficial short-term effects on hip and knee osteoarthritis. No long-term effects have yet been determined. More long-term studies are needed. Water Walking: Is It Right For You? Before trying any type of exercise, discuss it with your doctor. While water exercise seems like a good thing, be certain that for you, the benefits outweigh the risks (such as overusing damaged joints). Most arthritis patients have such a difficult time sticking with an exercise program because exercise can exacerbate pain in the short term. In the long term, exercise can actually reduce pain by strengthening muscles that surround the joints. It's tricky to know how much exercise is appropriate before crossing over into too much exercise or overdoing it. Water walking is becoming popular. Water walking is considered easy on the joints, according to the Arthritis Foundation. You can walk in the shallow end of the pool or walk in the deep end with a flotation belt. You can walk backward and sideways, as well as frontwards in the pool, to tone different muscles. Sitting along the pool edge and doing kicks or squats also enhance your water workout. If you are interested in water exercise and your doctor gives you the green light, consider working with a physical therapist to get some guidance and advice -- at least in the beginning. Aquatic exercise for the treatment of knee and hip osteoarthritis. Bartels et al. Cochrane Review. The Cochrane Collaboration. October 17, 2007. Water Walking. Arthritis Today. Camille Noe Pagan. 1/25/2008. Arthritis and Exercise: All About Water Workouts. The Johns Hopkins University. 8/23/2002. Aquatic Therapy for Arthritis. Caremark. January 18, 2007.